Although 10,000 people have the mailing or business address “Gibsons, BC”, only 4,800 of them reside in the Town of Gibsons. The next municipal elections will be held in November, 2022. The Gibsons area is part of the traditional territory of the Squamish Nation, who own the Chekwelp lands on the northeastern border of the Town of Gibsons. 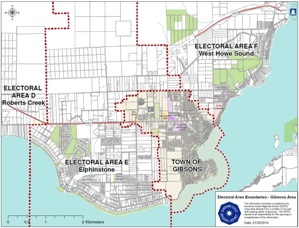 Businesses in the Town of Gibsons are required to have a business license that is also valid in the District of Sechelt. There are no business licenses in the regional district, however if you wish to run a business on your property, the zoning must allow it. The Town of Gibsons publishes a Public Parking Map for Lower Gibsons.